Sitrex, one of the world’s top mower manufacturers, produces a very simple, tough, precision built machine making it an ideal choice for the contractor or farmer. The models sold in the UK have been designed with high usage in mind, heavy duty headstock, strong overhead bar support frame and a double bar, disc module trough. These are just a few features that make this a truly tough machine. The drive train is protected by a breakaway system. The pressure that the cutting bar rides on the ground is minimised by a double acting weight transfer spring system. 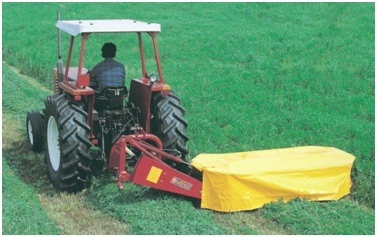 All machines are standard with hydraulic fold. If a seal or bearing is damaged by discarded string or general wear, each module can be independently removed for repair. All Sitrex mowers are driven by either three or four B section belts from the PTO input shaft down to the cutting bar gearbox. Heavy duty cutting discs are now standard on all machines to cope with stony conditions.